When I was little I must have read the The Magic Porridge Pot by the Grimm Brothers very often. Because every time I cook Farina Porridge and watch the farina (Grieß, or, more precisely, Weichweizengrieß in German) swell up in the boiling milk, I think of how the porridge in that fairytale keeps cooking and cooking until it fills the kitchen, then whole house, then the whole neighborhood as if it wants to feed the entire world. 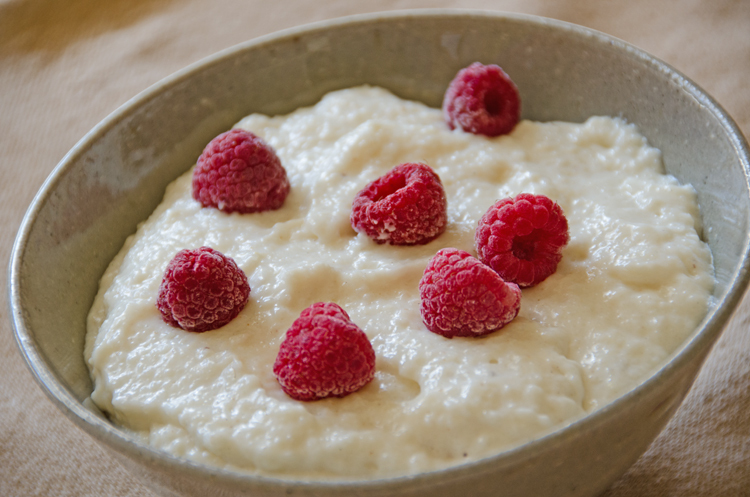 Farina Porridge, eaten warm or cold, is classic German comfort food. When it is still warm, Farina Porridge is smooth but when it cools it solidifies considerably. The secret to make it creamy and smooth again: add a few tablespoons milk and/or cream and beat it with an electric mixer for a few minutes. 1. Bring the milk with the sugar, vanilla sugar and butter to a boil in a heavy saucepan, stirring once in a while to prevent the milk from scorching at the bottom. 2. Slowly pour in the farina while beating vigorously with a wire whisk. Immediately reduce the heat to a simmer and cook for 5 minutes, whisking constantly and scraping over the bottom of the pan. 3. Remove the pan from the heat. Serve warm or let it cool and refrigerate until serving. To smoothen the cooled porridge, add a few tablespoons cold milk and/or cream and beat with an electric mixer for a few minutes until smooth.